It’s Passover. It’s been three months since I last saw you Mom. There are days when I say, “Alright already, enough of this Ma, I want to see your face, I want to hear your voice, I want to feel your love”. I still can’t conceive that I never will again. And so it’s time to clean the mud off of the heels I wore the day I bade you goodbye. I kept that mud on those heels because somehow it kept me closer to a time when I still had you. You are so far away from me now, you are eons away. Time takes on a different texture now, it is heavier than before. My heart is a trunk full of gratitude for all that I have, and for all that you gave me. I go on, I move on in life, I know what to do because you taught me so well, but I miss you. It’s Passover and as I make the Matzoh balls for the soup, I hear you telling me that I make the best soup, that there is nothing like my soup. We sit down for the Seder, it is a fine Seder, we sing, we laugh, we tell the story and have our four cups of wine. But you’re not sitting next to me Mom, and I miss you. This recipe has 3 key things going for it: It’s Passover friendly, it’s vegetarian, and it’s a delicious way to spice up any meal. Since we’re so limited at Passover, when we get tired of the typical starches and kugels, this is a very refreshing taste. It’s a unique recipe that neither I nor my family has seen in any restaurant. I learned it from Doña Tere, a beloved housekeeper who had a place in both my and my mother’s home for over 20 years. There are a few key parts to this recipe, and they’re all about frying. First, pat the florets very dry. This is to make sure the batter sticks. Second, be ready to start frying the florets as soon as possible after the batter is made. And third, keep the temperature of the oil right while frying. 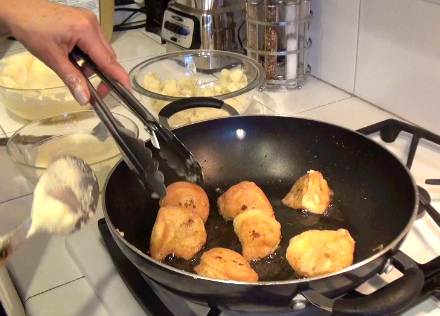 Having the pan with hot oil ready before you start dipping the florets in batter is the best way to do this. That way, you just drop each floret in the pan as you go (the longer you let the batter sit, the more it loses its consistency). As far as temperature, while I was making the recipe, my Mom would constantly adjust the stove up, then down, then up, then down. I couldn’t understand what she was after – then it clicked: the flame has to go up and down to keep the oil at the temperature it should be, just lightly popping the entire time. Using wooden spoons with soft edges helped me keep the texture uniform on the florets, with the perfect mix of golden color and fluffy consistency. Cut the cauliflower in half, separate the florets cutting the large ones in half or even in thirds (See video demonstration). Discard the stem. In a medium pot bring the salted water to a boil. Add the florets and boil for 6-8 minutes…until tender, but not too soft. Do not over boil! Remove from heat to a strainer, rinse under gently running cold water, and set aside. Place egg whites, and 1/8 teaspoon of salt into a bowl and beat with hand mixer until firm. Gradually add the egg yolks into the beaten egg whites, and continue to beat with mixer until mixture is fully incorporated . Heat 3 tablespoons of oil. Place 1 cup of the batter into a separate smaller bowl and dip one floret at a time in the egg batter (from smaller bowl), placing each coated floret into pan with hot oil. Make two – three batches…one batch will contain 5-7 florets. As soon as the lower edges of the florets begin to brown, turn them over. You will need a pair of tongs to fry the sides of each piece. When golden on all sides, remove each floret and place on a paper towel to absorb extra oil. You will have to add oil to pan between batches. In the same saucepan where you have finished frying florets, place diced onions and allow them to fry until they glisten. Add the diced tomatoes, bring to a simmer, then add water. Mix continuously with a spatula allowing mixture to simmer for about 3 more minutes. Add crushed red pepper and salt and stir for another 2 minutes, until you get a somewhat thick consistency. Place battered cauliflower in serving dish and spoon sauce mixture evenly on top of florets. Serve hot and enjoy!